Here is a group of modifications for guitars with 3 pickups. Each mod has an explanation and details of each modification, and whether the mod is internal or external, or both. Function: This wiring mod results in a unique set of pickup combinations and sounds, basically a telecaster set of sounds that you can blend together and also get the sweet strat tone. Control: Push-pull pot under tone knob or DPDT toggle switch added to pick guard. Function: The phase switch mod allows a pickup to have its polarity reversed - putting it out of phase with other pickups. 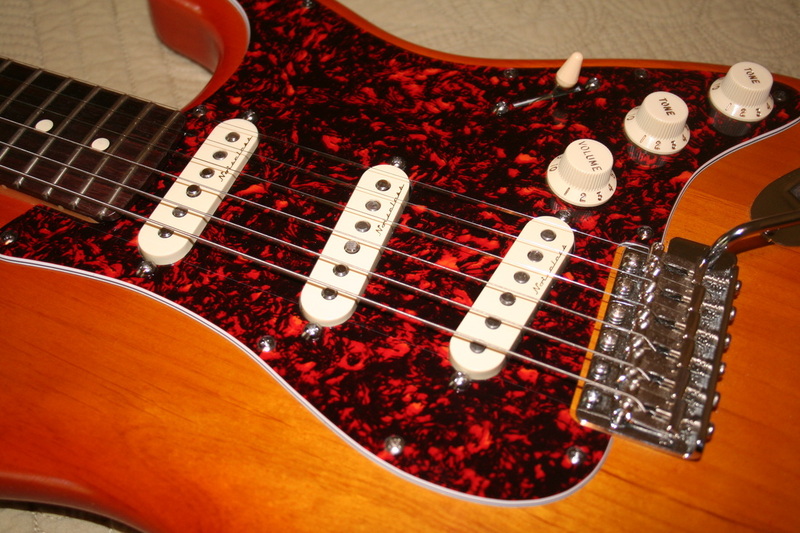 This leads to phase cancellation between pickups and can create some very distinctive tones. Function: One tone control controls tone across all pickups / combinations. You now have an extra tone pot to use for for other mods, etc. Control: No-load blend pot replaces 2nd tone control. Function: The blend pot works in conjunction with the 5-way switch in different positions to add / blend the neck and bridge pickups for different combinations. Control: A 4-way switch installed in your Telecaster to replace the stock 3-way. Function: You get additional pickup combinations: Bridge-Neck (Series), Neck, Bridge-Neck (Parallel), Bridge - additional sounds for your Telecaster. Function: A 5-way Super switch installed in your Telecaster to replace the stock 3-way. You get additional pickup combinations: Neck (normal tele), Neck-Bridge (Series), Neck-Bridge (Parallel - normal tele position #2) , Neck-Bridge (Series - Out of Phase), Bridge (normal tele position #3) - additional sounds for your Telecaster. Function: A combination of these system components generate a near "endless array of pickup combinations". Function: Turn on this mod to get a bunch of additional pickup combinations and tones, including the ever popular all 3 pickups at once. Function: With this modification - you get a noticeable treble boost mod for your Fender styled guitar. Your bridge tone pot is now a push-pull pot with the standard 250K and a 1 Meg tone pot combined - you can use one or the other to adjust your tone - this results in a wide tone variation if needed. Control: No-load pot under the middle pickup tone knob. Function: Depending on the position of the 5-way switch, you can turn the tone/blend knob and blend different pickup combinations. Your guitar is now wired with a master volume, a master tone, and a blender pot. Function: toggles replace 5-way switch, giving 13 different tonal (useful) sound configurations. Control: 3 Volume controls in pick guard (tone pots have been removed - no tone adjustment). Function: Volume control of all 3 pickups independently - for those guitarists who don't use their tone controls anyway! Function: What this mod does is allow you to have the neck pickup on when the selector switch is in the bridge, bridge/middle, and middle positions.As those of you who play strats know, the bridge position provides the most quack and twang, and the neck provides the fullest tone. With the bridge and neck on, you'll get a little of the best of both worlds.